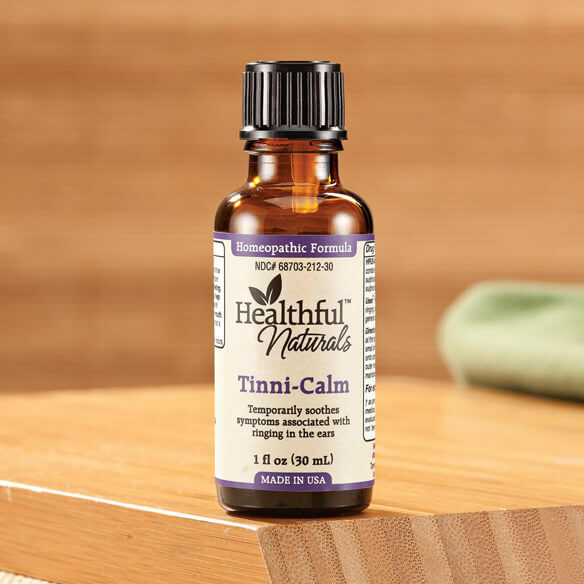 Healthful™ Naturals Tinni-Calm is a safe, effective topical homeopathic remedy supports ear health and balance to help calm symptoms associated with tinnitus. Temporarily soothes occasional ringing, buzzing, undesirable noises and general discomfort in one or both ears, which can be caused by aging, inner ear damage, earwax blockage, tinnitus, and other conditions or medications. Massage a small amount into the tragus, the triangular cartilage on the outer ear, as well as the outer nostrils while inhaling deeply and slowly to maximize its aromatherapy benefits. Tinnitus relief treatment naturally soothes discomfort associated with occasional tinnitus. Aromatherapy properties help you stay calm and relaxed. 100% homeopathic ingredients in grapeseed and essential oil base. Active ingredients: carboneum sulphuratum, chamomilla, chininum sulphuricum, salicylic acidum, silicea. No artificial fragrance, synthetic or petrochemicals, or parabens. Shake well before using. Use at first sign of symptoms. Dispense a small amount into hands. Massage gently on to cartilage of outer ear canal and outer nostrils. Inhale deeply & slowly, maintaining stillness. Repeat as needed. my wife told me to. My husband has ringing in the ears and I saw this product. He says it helps and any help is wonderful. He uses it when needed. Definitely works. Your catalog listed what might be of help for my tinnitus.